Broken… Broke… Cry… Goodbye. Lie, Lay, Laid. …whispered by the strokes of a brush, in the colour of memories… Shaped by emotion. A room with many views, by a trio without choice, and Art as a voice. Established Derbyshire artists Lor Bird, Sara Brighty and John McDonald embark on a journey exploring each artist’s personal reflections of their lived experience, and what inspires their art. Holding up a mirror to life, this intriguing trio take the (highly unusual) step of asking questions of creativity by making new art: observing and exploring each other. The answer is an exhibition which is diverse and beautiful, with work ranging from large statement paintings, to small works of exquisite delicacy. Déda visitors are also invited to find their own answers, through participation in Life Drawing and Portrait workshops. Join the artists for a vibrant launch on Thursday 8th November, with live music, a celebration of creativity, and the unveiling of brand new commissioned works. Lor Bird, a sensuous and sensitive colourist, is known for her glowing landscapes, both figurative and semi-abstract, as well as resonant still life work. We look forward to seeing how this award-winning painter translates her expressive and subconscious responses to her environment, into portraiture. Sara Brighty’s work ranges from ink drawing and painting to sculpture, performance and film, but always with a physicality which imbues forms with emotions. Sara, who has worked with Anthony Gormley, is an artist both poetic and visceral, for whom bodies and objects are inseparable from meaning. 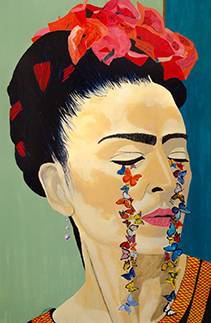 John McDonald, who paints with unashamed passion and pathos, has received international acclaim for Butterfly Cry, a series of portraits of Frida Kahlo. John’s background in theatre is evident in his ambitious installation, and paintings where a staged scene is set, and a dramatis personae is created. Inspired Reflections explores some of the hidden or intuitive aspects of an artist’s work, and hopes to shine a light on what can inspire an artist to be creative.